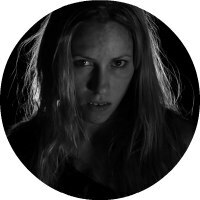 The film has great cinematography and I love the use of low-key lighting and the black and white colouring - it really gives an eerie feel to the film, and I feel like it has a slightly self-aware vibe, in the way that it doesn’t take itself seriously or try to be too realistic. 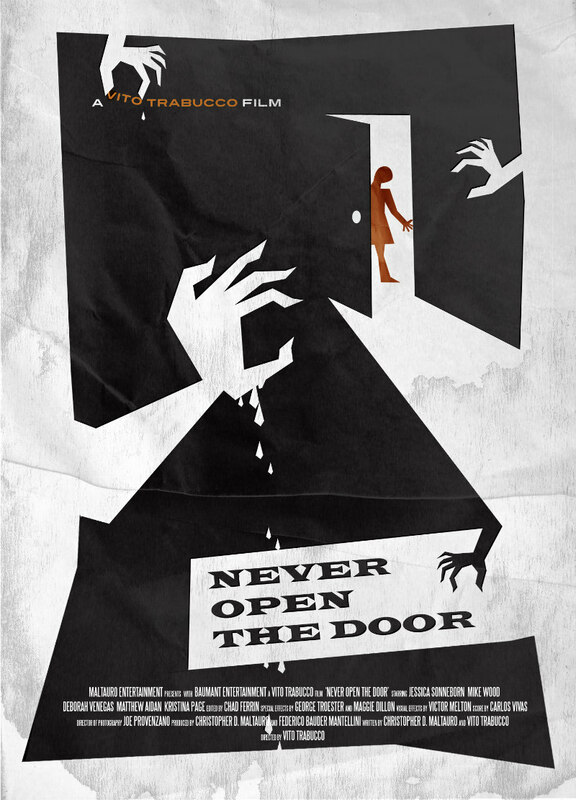 Never Open the Door is directed by Vito Trabucco, who is known for directing Bloody Bloody Bible Camp in 2012. This film is a short feature at only 1hr and 4mins, but it certainly does pack a punch in that short time. The film is set in a cabin in the woods and follows six friends celebrating thanksgiving in the cabin lodge, which nobody knows who actually hired it for the night. Of course from the title, it’s easy to see that somebody is going to open the door, because what is a horror film without our main protagonists not following the most logical advice? It all goes downhill when our guests are enjoying (or maybe not) a conversation at the table when there is a knock at the door and one of our characters, Tess (Jessica Sonneborn), decides to answer the door to be met by a man who appears to be stabbed and coughing blood, before he draws his last breath over her. I like the way the film looks, it’s got great cinematography and I love the use of low-key lighting and the black and white colouring, - it really gives an eerie feel to the film and I feel like it has a slightly self-aware vibe, in the way that it doesn’t take itself seriously or try to be too realistic. The makers of this film want the audience to know that they’re watching a film. The spectacle of the film set aside, the story and characters is where the film is found lacking. The opening 10 minutes is where it really needs to excel in selling and showcasing the protagonists to the audience, and I don’t think this is done well at all. They seem rather distant with each other and don’t look like old friends who would celebrate thanksgiving with each other – the conversations are odd and they all look like they don’t want to be there. I mean, no wonder Tess answered the door. I also find the story to be really disjointed. After the opening of the door, things just get very confusing. I like how the film tries to play with the audience's mind as to whether there’s an actual threat or whether paranoia and jealousy are just taking over and spiralling the characters out of control, but it’s not done well enough and it just becomes a jumbled mess to the audience. Because of this I don’t think the supposed surprise ending has the effect which was intended. Yes, I like the premise of the film, and besides the stereotypical title and location, it’s quite an original plot; I just don’t think the execution was handled well enough. Never Open the Door is on DVD and VOD now.